Minister Charlie Flanagan, Minister Heather Humphreys and Supermac’s MD, Pat McDonagh at the announcement in the Killeshin Hotel in Portlaoise today of the three hundred jobs created by Supermac’s and Só Hotels. The continued expansion of Supermacs and its sister company SÓ Hotels gathered pace last evening when Minister for Business, Enterprise and Innovation, Heather Humphreys announced the creation of 300 jobs. 200 jobs will be created in three new Supermac’s outlets in Wexford, Waterford and Kinnegad, and 100 further jobs will be created through the redevelopment and refurbishment of the Athlone Springs Hotel, the Castle Oaks House Hotel, Limerick and the Killeshin Hotel, Portlaoise. Construction has already begun in Kinnegad with construction due to start in Wexford and Waterford. A further 300 jobs are in the pipeline in Letterkenny, Longford, Ennis and Portlaoise - subject to the granting of planning permission. Mr McDonagh announced last evening that he intends to spend a further €1/2 million on the further modernisation of the Killeshin. This follows on from the recent refurbishment and redevelopment work at the Portlaoise hotel. “The Killeshin Hotel has been a real success story for us,” Mr McDonagh said. “We recently refurbished the bar, the main lobby as well as the meeting rooms and under the guidance of the General Manager, Michael Murphy, the hotel has gone from strength to strength on the back of that. Mr. McDonagh recently announced a €1.5million investment in the Athlone Springs Hotel to develop and refurbish the hotel he purchased in the summer of 2018. The Castle Oaks House Hotel in Limerick was purchased before Christmas and will also undergo refurbishment and development in the coming year. Supermac’s is Ireland’s largest indigenous quick service restaurant chain. The latest Supermac’s store to open was in Donegal Town, the 1st Supermac’s to open in that county. The company currently has 116 outlets across the country having opened eight outlets in 2018. The 4-star SÓ Hotels Group is also owned by Pat and Una McDonagh which also comprises The Lough Rea Hotel and Spa, The Castletroy Park Hotel and The Charleville Park Hotel. 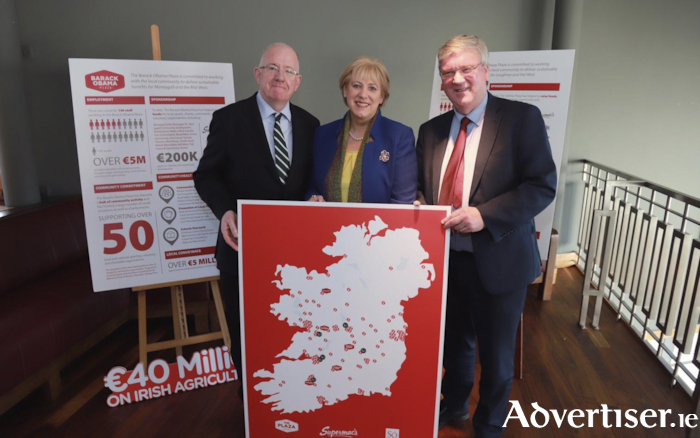 Minister for Business, Enterprise and Innovation, Heather Humphreys TD said she was delighted to announce the creation of 300 jobs by the Supermac’s and SÓ Hotels Groups. Supermac’s MD, Pat McDonagh, said that the positivity in the regions was one of the key reasons for recent investments. “What makes Supermac’s different is that we source as much of our produce as we can from local suppliers,” he said. “That starts with the building process and continues on to the supply of the food that we supply our customers. “We will be engaging in a major recruitment drive to get staff for these new openings in Supermac’s and the hotels,” Pat McDonagh said. “We have career opportunities at all levels. We are looking for staff in the area of managers, chefs, and a variety of catering, retai,l and catering opportunities. We put structured career paths in place and we are looking for people that want a career -people that will stay with us and develop with us. A lot of our franchisees in Supermac’s are people who started working for us initially,” said Mr McDonag. Supermac’s to launch new dating app! !